I have been writing about the growing threat I see coming from Washington, D.C. I see this nation traveling down the same road Germany traveled in the 1930’s, and for many of the same reasons. But there are people – ignorant people – who tell me this could never happen here. That second picture is a picture of AMERICAN troops, here, on American soil! 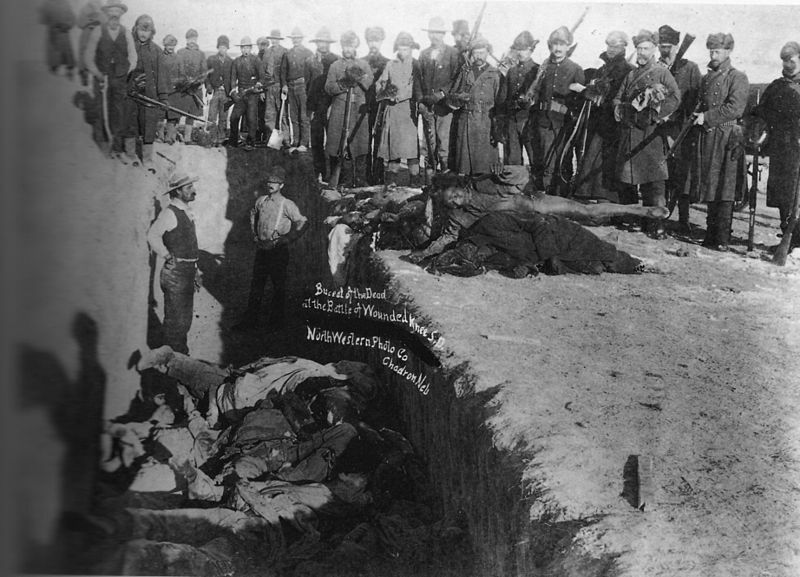 The Battle of Wounded Knee was about government confiscation of weapons. Not only did our government try to take the weapons from free people, they massacred them – men, women and children. Then they handed out medals to hide their shame. So don’t tell me it can’t happen here again. The stage is already set for it to happen, and on a grander, nation-wide scale. All they’re waiting for now is the right excuse. I have to flag these reinforcements of disinformation whenever I see them because I understand how brainwashing (hypnosis) works. I understand that even after one has been shown the facts and understand they have been lied to, they can relapse to their hypnotic state with reinforcement of the lie. THE NAZIS NEVER DISARMED GERMAN CITIZENS! 1N 1938 HITLER LIFTED THE GUN RESTRICTIONS IMPOSED BY HIS OPPONENTS FIVE YEARS BEFORE THE NAZIS EVEN WON THE ELECTION. HE ARMED THE GERMAN PEOPLE TO THE TEETH. EVEN WIKIPEDIA ADMITS THIS NOW! And of course, only the clinically and legally mentally retarded still believe the long disproven myth that millions of Jews were killed in gas chambers. Except those deemed enemies of the state. Those were rounded up, tattooed with a number, tracked on IBM cards and pressed into forced labor for the greater good of the Reich.